It is that time of the year again when we automatically start to think about the year that was and what we want from the year that is coming. It is just in the way we are programmed by the way our calendar works. On this arbitrary (because it is mostly arbitrary) day I will stop my countdown of the days and start over again from 1. And there is a lot of pressure that comes from that. We feel the gap between what we want and what is more at this time of year. And I’m okay with that. I think that it is good for us to take time to take stock of our lives and our happiness and figure out the life we want and are meant to live. We go on autopilot so easily. We often go about this stocktaking and goalsetting way wrong though, which is my theory on why New Year’s resolutions don’t work. Except for the fact that most people don’t know the psychology and practical steps of changing a habit, most New Year’s resolutions don’t work because they are born in the desperate, almost self-hating energy of the gap, rather than from a place of genuine excitement about the possibilities and gratitude for the ways that is already showing up in your life. I do want you to use the impetus for change that comes naturally this year, but to use it in a way that sets you up for success. So, I put a tool together from listening to a lot of different manifestation principles and techniques over the years. I’ve used it, not in its current elegant format, but in its essence, for years and it really works. Because it is the season of giving, I am making it available not only to the people in the Soul Time Collective but to everyone and anyone who feels they want to start 2019 with intention. 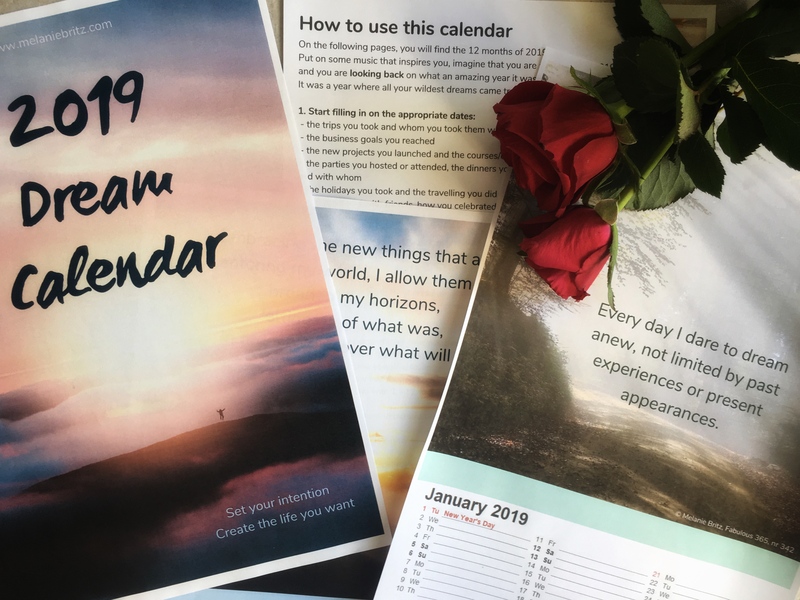 It is called the Dream Calendar, and it comes with basic written instructions, but also an expanded explanation and guided process in an accompanying audio file. 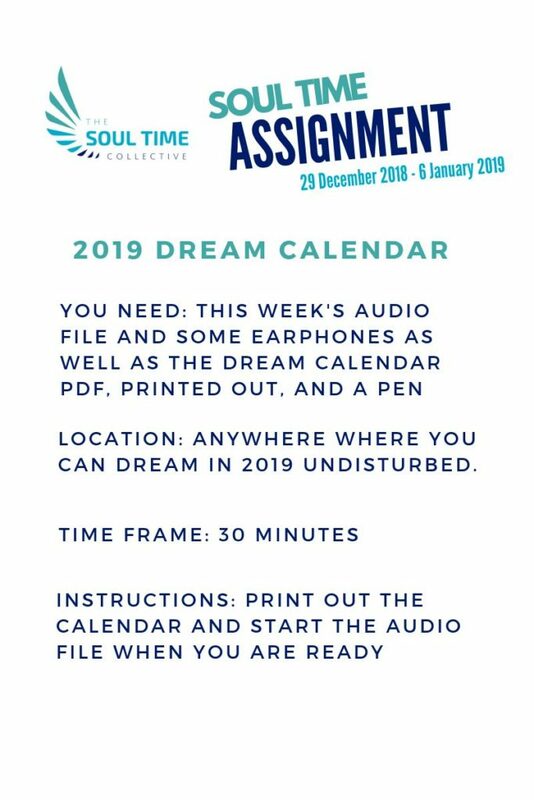 to download the Dream Calendar PDF you need for this exercise. 2. Once you have the PDF, print it out. 3. Then listen to the audio recording below. You can also do it on your own by simply reading the instructions on page 2 of the PDF document, but the guided audio file below will expand and give an added dimension to working with your Dream calendar. Click on the audio file below to listen to it, once you’ve downloaded and printed out the document to work on. (If you need more time with any category, just pause the recording until you are ready to proceed to the next one). May 2019 be your most fabulous year yet!